Das Best Western Mt. Pleasant Inn ist ideal in Mount Pleasant Stadtzentrum zu finden. Erleben Sie ein schöner Aufenthalt in der Nähe von alle Sehenswurdigkeiten. Bestpreisgarantie und exklusive Angebote. Erleben Sie im Best Western Mount Pleasant Inn saubere und attraktive Gästezimmer, zusammen mit einem ausgezeichneten Service und herzlicher Südstaaten-Gastlichkeit. Unser Hotel in Mount Pleasant, TX, erfreut sich einer zentralen Lage im schönen Nordosten von Texas. Gäste können in der "Barschhauptstadt von Texas" angeln und auf einer Fläche von knapp 7000 Hektar zahlreiche Wassersportangebote nutzen. Das Hotel ist nur wenige Minuten vom bezaubernden Stadtzentrum und ein paar Kilometer von Big Tex Trailers, Prieferts Manufacturing und Pilgrim's Pride entfernt. Für das leibliche Wohl unserer Gäste sorgen das Restaurant „Applebee's“ in der Nähe und das privat betriebene „Mardi Gras Seafood Restaurant“ mit authentischer Cajun-Küche, Fisch und Meeresfrüchten und Steaks. Filialen von McDonald's, Burger King und Subway® liegen ebenfalls in der Nähe. Nach einem anstrengenden Geschäfts- oder Urlaubstag versprechen unser erfrischender Swimmingpool (im Freien) und der Innenhofbereich Abkühlung und Entspannung. Sie haben die Wahl: Buchen Sie eines unserer frisch renovierten, geräumigen Gästezimmer oder eines der luxuriösen Executive- und Jacuzzi®-Zimmer. 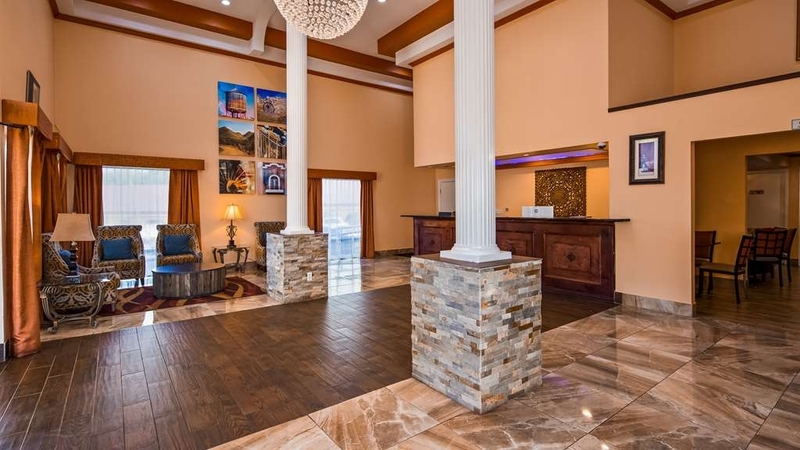 Die Gäste unseres Hotels in Mount Pleasant, TX, kommen in den Genuss zahlreicher Annehmlichkeiten. Dazu gehören ein komplettes Deluxe-Frühstück, Mikrowelle, Kühlschrank, Haarfön, Kaffeemaschine/Wasserkocher, Bügeleisen und Bügelbrett. Ein Executive-Schreibtisch steht in allen Zimmern mit kostenlosem drahtlosem Internet (Wi-Fi) zur Verfügung. Jedes Zimmer ist ausgestattet mit 32"-Kabelfernseher mit HBO®, ESPN und vielem mehr. Ein Wäschereiservice für Gäste und ein Fitnessstudio sind ebenfalls vorhanden. Buchen Sie noch heute im Best Western Mt. Pleasant Inn, und erleben Sie bei uns den hervorragenden Gästeservice, denn Sie von Best Western erwarten. Das Schwimmbad ist ab 15. September 2018 saisonal geschlossen und wird am 30. April 2019 neu eröffnet. "Cheap clean rooms, great value"
Great value for the money... you getThis is a clean room and a nice place to sleep for a cheap price. Very worker-oriented motel so parking may be limited but as long as you're not expecting the Ritz Carlton, you'll be happy with this room. The rooms are accessed from the outside, rather than entering through the lobby. The rooms are great...not big, but super clean, very comfortable, and decorated really nicely. The bed was great, the linens were great, the tub and shower was great with good water pressure. The room was user friendly with everything you need. The soap and shampoo was high quality. Easy access to highway but the rooms face away from the highway noise, so it was a quiet sleep. I would definitely stay here again. We had a noisy neighbor, and she was very loud in the morning, talking right outside our room on her cell, but that is not the hotel's fault. The parking lot is well lit and I was not at all worried about leaving stuff in the car. Overall it was a great stay and I would definitely stay here again. The parking is good. The check inn went fast. The lady that checked me in was very friendly and professional. The rooms were nice and updated. I beds were comfortable. The shower had good water pressure. The internet was just ok. This hotel is good for travelers that just need a place to sleep right off of the highway so your not far from route. It was clean but the shower clogged up so I was showering in my own filth. Breakfast was just ok.
"comfortable bed for good sleep, reasonable rate, clean"
The room was clean. The bed was very comfortable. I liked the free wifi. The ice machine worked well but had an awkward low positioned output that took two hands to hold a bag over it while a helper pushed the button. The place was a bit noisy on the weekend that I stayed there. The staff was friendly. I didn't try the free breakfast and didn't watch any TV. There is a considerable dip between the parking lot and the street, so be slow and careful when going over that with your vehicle. "Headin' Home on a 3K ride on HD Motorcycles"
Excellent hotel, clean, front desk gave us excellent service. They let us park our bikes at front area under the drive through balcony. Our room overlooked the swim pool. Several Restaurants near by which we ate at Applebee's. "Affordable with great service. " This hotel was very affordable and the staff were friendly. We stopped twice. On our way to our destination and on the way back. 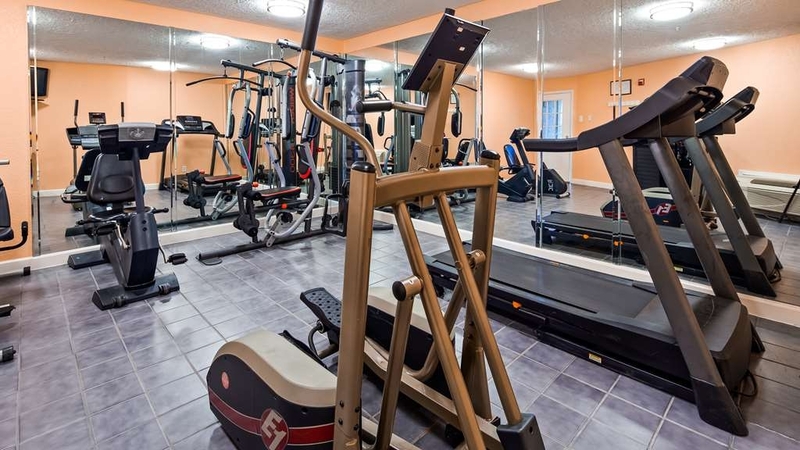 The hotel also provides a complimentary breakfast and pool. It is nothing fancy but definitely a great value. Check in was great and friendly at 1am. I am a smoker, so I don't need a fancy room. The bathroom area was clean and acceptable, as well as the room itself. Only housekeeping needs to clean better under the bed skirt. There were stains on the carpet. I really don't require much, I only had two issues that are not of great importance. One was that there was not a plug outlet in the cubby where the coffee station is in the room. The second was check out, which is their policy and every Best Western is differently managed, because I am a day sleeper I was asking if they could work with me on an extra hour for check out. I would've been charged half a night's stay if I did do an extra hour for check out. So for those days sleepers, stick with their policy and check out when or before you are expected. My only hats off goes to the over night staff, they were inviting, friendly and resourceful! Oh, the most important thing, was that the bed was comfortable! I slept very well! 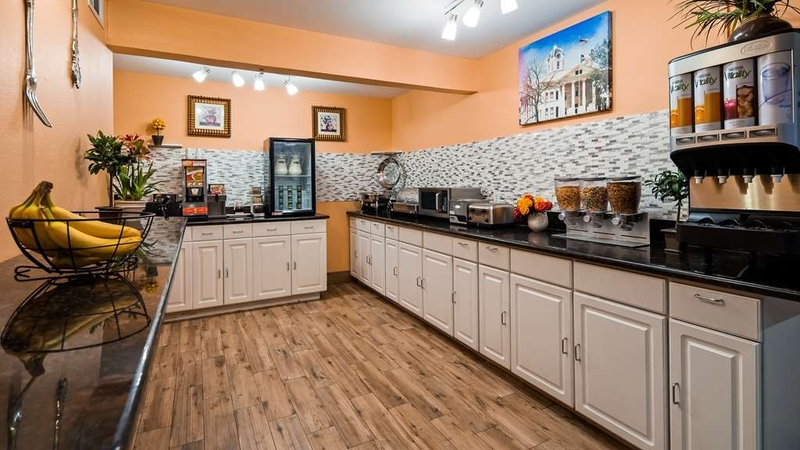 This motel is obviously an older property that has had a facelift. It looks very nice on the outside when you drive up, the lobby area is well done, the pool area looks nice, and the breakfast was satisfactory. Be sure to watch that you or your kids don't fall off the elevated walkway that has no safety railing in one section of the rooms. And there's that outdoor smoking area that serves as a congregation point to disturb the nearby rooms. In our room, there were no electrical outlets accessible near the desk to plug in a laptop computer. Fortunately I have learned to always pack an extension cord to overcome that problem. Then there was that noticeable gap between the door and frame. But my favorite amenity was the duct tape holding the floor lamp together. That's a nice touch. The motel reminded me of that old saying about putting lipstick on a pig. We slept okay and the rate was cheap, so it has that going for it. 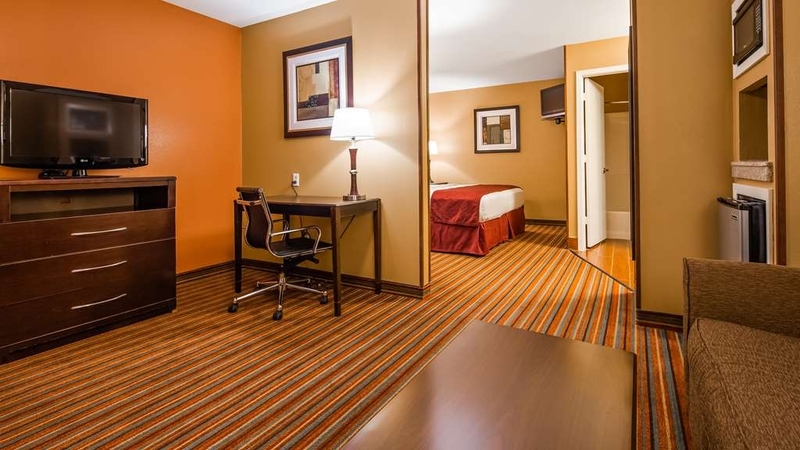 Great room, prices and enjoyable stay. The price was wonderful which is what had drawn us to the hotel. The employees helpful and the rooms clean. The breakfast was good and had a verity for everyone in our family. 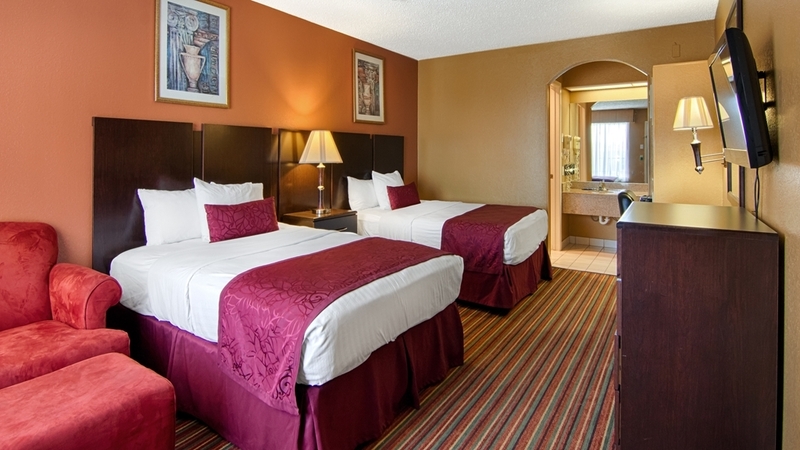 Rooms were clean and new, staff very friendly! 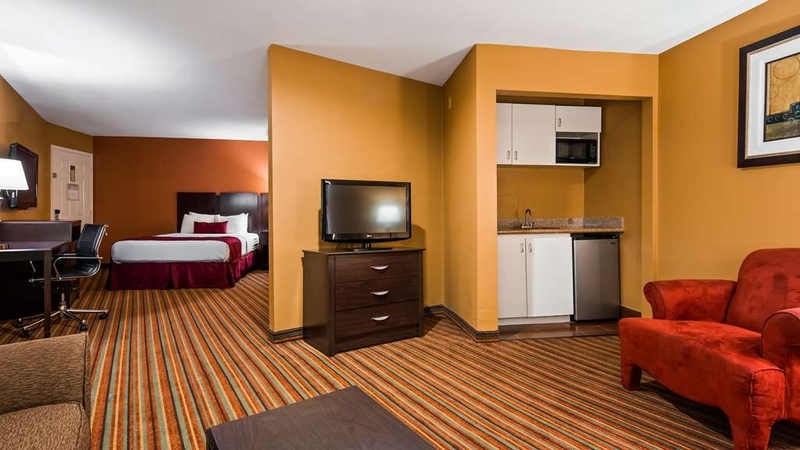 Best value for room and also pet friendly! Stay 2 nights while moving and enjoyed the pool! The beds were very comfortable and included plenty of pillows! "Fights outside, raging parties inside, no refund"
I was there for 4 hours and got zero sleep. There were about 20 people packed into the room below me having a party. Then a huge fight broke out and spilled outside in front of the room. People were crashing into walls, breaking furniture and throwing bottles. Awful. I grabbed my stuff and snuck out at 1:30 am because it was not a safe place to be. I told them what was happening outside and that i was leaving, and they refused to refund my money. Don't stay here, ever! One of the best hotels for the money that we've ever stayed at. Easily the equal to $100 room. The bed was super comfortable, the room was large and clean and the water pressure in the shower was awesome. Breakfast had a lot to offer and was very good! Easy on and off I-30. "Nice Rooms At A Reasonable Rate"
My wife and I stayed the night here on our way to Dallas. Our room was very nice with a couch and mini kitchen. Very comfortable bed. Shower pressure was excellent! Good coffee in the room, and plentiful breakfast options the next morning. King mini suite was just $65 plus tax. Great deal in my opinion. Booked while on the road, great rate. Rooms were clean but strongly smelled of a Lysol-type disinfectant which was off-putting. Bed hard as a rock in one room, comfy in another. Breakfast ok, OJ watery, couldn't make a to-go plate but understand there's probably a reason for that. Front desk check in was great. The locating and the way the hotel sits on the property is a bit off, wele had to go out on a road to get to the back of the place to access our room. 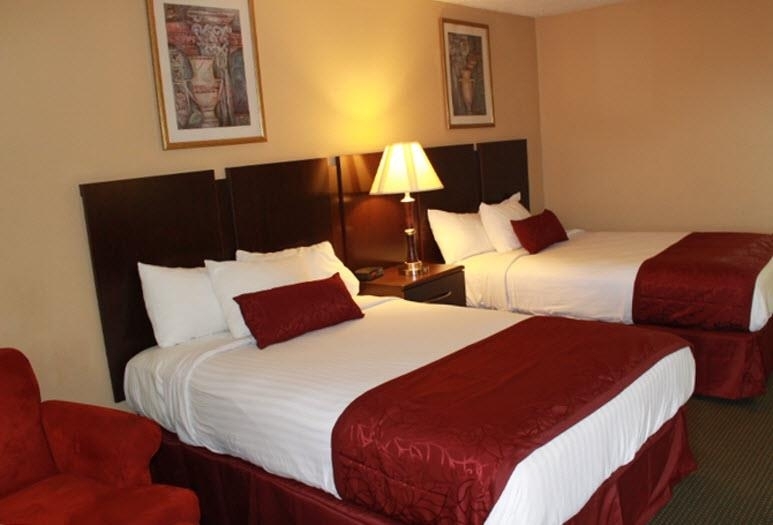 The room was clean and well appointed add far as bedding, only 2 regular sized & 2 hand & 2 face towels. But there were standard things like a coffee maker, iron & ironing board, Wi-Fi, 32" T.V., and hair drier. The things I did not enjoy or that were a disappointment? No lower rooms available, walking upstairs in rain - even in a concrete staircase - is not my idea of fun. Then while walking the top floor walkway is made of a tile that hers fairly slippery when wet, they have a sloped area with strips of gritty paper but don't step off the grit on those areas, I almost bit it a few times! "Good but could be excellent"
Good points: The staff was very friendly and helpful. Check in and out was prompt and efficient. Breakfast was top notch. Room was nicely done, Bed and pillows were excellent,best sleep I've ever gotten in a motel. Bigger bathroom than normal was GREAT! Easy access to and from the highway. Parking lot was first rate. Price was right on for a double. Could use work points: Light switch inside the door actually turn on a light so you're not entering into a dark room hunting for a light. Since travelers have more electronic devices today that need charged more electrical outlets and easier access to those available would be nice. Make vending machines more accessible to visitors in the backside rooms. Get a receipt on check out even if you booked online. Was told receipt would be emailed to me, I've been home 3 days now and still no email receipt. Summary: Would I stay there again? Yes, and I did. Circumstances were such I needed to stay in town an extra day so I returned to Best Western Mt. Pleasant Inn and got the same room again (which I did ask for). Would I recommend this motel? Yes, and I did. This hotel is rather old and a little difficult to get to. But the staff at the front desk are so friendly, and the rooms are clean. We've stayed there several times while traveling and are always satisfied. "Did not honor nonsmoking resv"
Reservation was for non smoking. Upon arrival nonsmoking unavailable and the staff very rude. Left even though was charged and stayed at next exit at the days inn which was cheaper and staff very friendly. This hotel was a great value for the money we paid. It also is a pet friendly hotel which is a must for us. 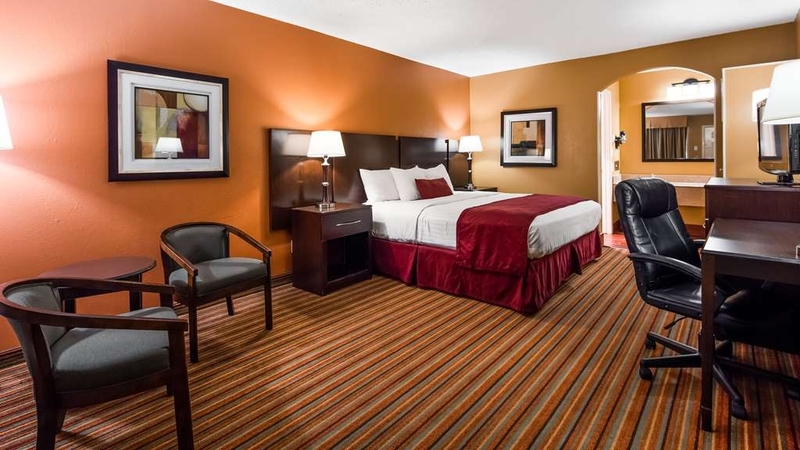 We found the room to be clean and appeared to be newly renovated. If we find ourselves in this area again and in need for a room we would certainly stay there again. No hassle, great bed, all was clean. The place was quiet, the room was spacious. The room had a small refrigerator and a microwave, a small coffee pot. The shower/tub had many safety grab bars. The staff was courteous and attentive. Have stayed here four times in the last 2 years always excellent service very nice rooms good rates. Very very nice place to stay. They are currently doing a little remodeling so the place will look even better than it already does. I will stay here again. "Nice stay - Mt Pleasant"
I was working in the area & needed a place to stay. This hotel worked fine. Good place for the price and easy access to places that I needed to go. Front desk staff were helpful and I didn't have any issues. Worked fine and will stay here again when in the area. "Tried to not honor our Best Western rewards"
I had to call Customer Service at Best Western before the general manager at this Best Western would honor our Best Western rewards. Customer Service called and made sure our rewards were honored, but it was a needless hassle. First the clerk here told us we had made the reservation through a third party website which meant we couldn't use the rewards—but we had used the official Best Western reservation site. Then they said we had to call their motel directly to make the reservation in order to use rewards, which is not true. The Customer Service rep immediately called the front desk, while I was on hold, and made sure the rewards were honored. The room was mediocre—we had two skimpy bath towels, the Kleenex dispenser had about three tissues left, but our biggest complaint was the Internet. The connection kept dropping. It was very weak. Breakfast was fairly good, though. I typically stay at Best Western properties when I go out of town for business. This hotel was something long before becoming a BW property. The exterior looks tired and run down. (Internet pics are deceiving) The rooms were remodeled and clean, but it was next to an abandoned restaurant that was overgrown. (Shares the same parking area) The cost was low so it attracted lower-class renters who were drinking beer all night and smoking marijuana at the pool. I didn't sleep too well because I thought my car was going to be broken into. I like BW properties, but this one probably shouldn't carry their brand. "Rest Stop / Sleep Over to Family visit"
We had a very restful stay over. The Room was spacious and the Bed was extremely comfortable. The interior of the Room was well planned in that having the Refrigerator, Coffee Maker, and Microwave "stacked " impressed us, as we travel a couple of times every year. Handy place to stop on route to southern Texas. Have a good hot breakfast and clean comfortable beds. Little pricey for age and overall condition of property. Front appearance of property leaves a lot to be desired, ie., next to abandoned restaurant, several semi's parked by front entrance and basically no curve appeal. I usually use this Hotel every year during our Family Reunion! The owner and his staff are very friendly! My Sister & her children LOVE the pool! Especially the cool design in the bottom-dolphins! ='. '= They help you with your needs and are very sweet about it! 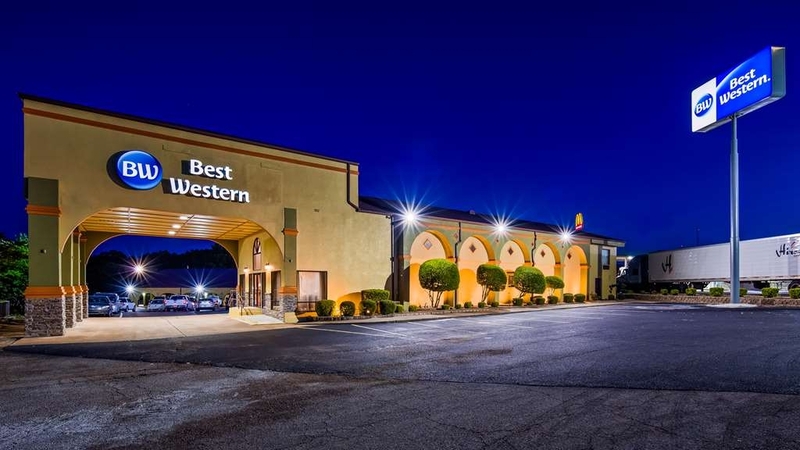 I will always stay at this Best Western when traveling to Mount Pleasant, TX! We decided not to stay the moment we walked in the door. We got the family suite on the second floor and it was non smoking, but it still smelled like smoke because outside the room was a garbage can/ ash tray. The gap in the door let all the smoke in and bugs into the bed that was almost touching the door when you opened it. The floor in the room had two downward hills in it, that my two small children kept tripping and falling down ( on the dirty carpet) . my husband was carrying our bag down the stairs and almost fell because the rubber matting was loose and hanging off the step. The bathroom had hair and dirt in the shower and the floor was not cleaned either. Pay the extra money and get something cleaner and more safe. We had made a trip to Texas and were traveling back and wanted to stay on the east side of Dallas so we would not have traffic the next morning. While there are not many motels in Mt Pleasant, I read the reviews on Trip Advisor and chose to stay at the Best Western. The room was very clean, price was very reasonable, and while the motel was several years old, you could tell it had been updated. Best breakfast we have had in a long time in a motel. I would certainly recommend this motel. "My stay at Mount Pleasant Inn"
I was in Mount Pleasant to attend the Funeral of my Aunt. The room was cooler than I was used to. and there was no was to change the thermostat. It would have been better if the restaurant next door had not been closed. "If they have your credit card number they will charge you!!" I booked two nights through booking.com with free cancellation up until 3:59 of date of check-in. When my son's baseball tournament was cancelled I went online at booking.com to cancel around 12:30. Booking.com states that the hotel only charges when you check in and hotel confirmed this when I called to find out why they charged me for the two nights. They claim they did not do it that booking.com did. The hotel acknowledged receipt of the cancellation notice. I thought maybe it was a pre authorization and would fall off but next day they charged me for the one night even though I cancelled in plenty of time. Desk personnel are clueless and the manager is never in and will not return calls. I had to get my bank involved. The hotel was older than most but was in excellent condition. I would say clean and comfortable. Staff were helpful and professional. Breakfast was excellent. We would certainly stay here again. The rate was another excellent factor for staying. Of all of the Best Western hotels I've stayed at, this is my least favorite. As is always my experience with Best Western the staff was amazing I wish the hotel were in better condition. We ended up in what they called the honeymoon suite, I mentioned if this was my honeymoon suite I'd be getting a divorce. The floor was dirty the carpet was old and bunched up. There was a hot tub in the middle of the room but there was scum all around the side of it & there was hair and something that looked like mold in the jets there was also some type of debris in the bottom of the tub. So I was unwilling to even get into the hot tub. hotel was easy to find right off the interstate. room was clean and comfortable. Great price. I was not expecting to have a full breakfast at that price. I would stay there again and recommend this hotel if you are traveling in the area. 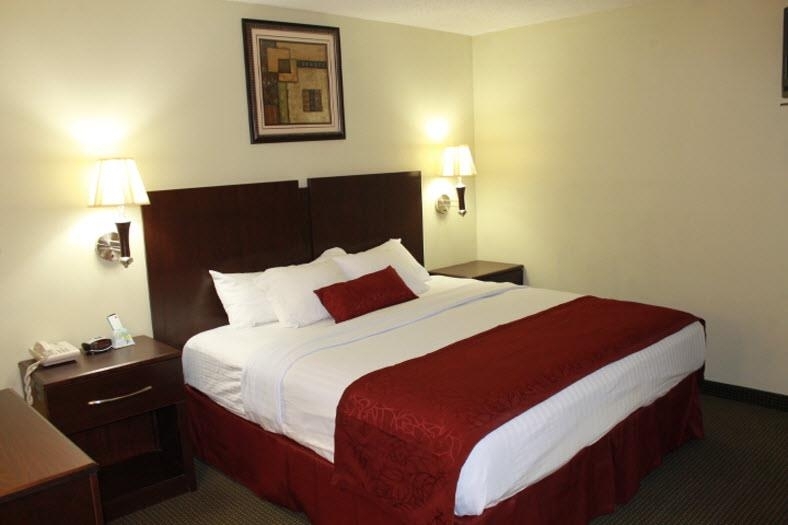 Great nicely lit lot, friendly staff, very very comfortable bed. I was astonished. The clerk was great, the room was a very artsy color (deep red) loved it I don't know what else to say but it was on par with hotels almost twice the price! And it was almost as good as the hotel I stayed in in Hollywood at 5x the freakin price!!! I visit a friend in Mt. Pleasant twice a year. This hotel is a reasonably-priced hotel option for me and comfortable for my stay. I appreciate the in-room mini-fridge and microwave a s well as the breakfast offered daily. It's nothing fancy, but the bed and bathroom are clean and we bring our DVD player to watch movies, so it is a nice stay (HBO is good, too!). Clean updated room, very comfortable. Very good breakfast. Great value, better than some more expensive places. From exterior looks somewhat dated but once in the room surprised on how nice it was. Highly Recommend! This hotel was very clean!! 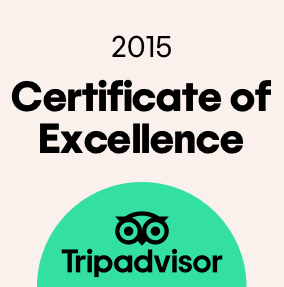 Staff were extremely nice and helpful. Great experience!! Location was 5 minutes from softball fields. Swimming pool was nice and clean. Staff was constantly trying to help! Very nice room with comfortable beds. Breakfast was terrific and staff was very friendly and cheerful. Would definitely stay here again! Another reviewer called it a hidden gem and we completely agree! "Quiet location somewhat aggressive staff." Stayed two different times, first time room was very nice and modern, second room was a bit more dated. Everything worked, had a nice pool, somewhat small parking lot in the back. My complaint is the breakfast Nazi that chases people down and yells at them for trying to take breakfast to go. Didn't happen to me but saw it occur several times. Seriously calm the heck down, what does it matter if they take a crappy sandwich to their room? Seems like poor management to act like that over a fifty cent item... Will make me think twice about returning when there's several other hotels in the same price range in the immediate area. We didn't want to drive all the way to Dallas and took a chance on this hotel. We were happy we did. The staff was friendly and helpful. The rooms were clean and surprisingly well-appointed. We could see that they were in the middle of updating the property, including new toilets! Considering the price for the room, it was a great deal. Plus, the breakfast was one of the best I've seen at a hotel of this kind. "A place to rest your head"
We have stayed at better Best Western's. I think they bought an old hotel and remodeled it, but it is still old. Since we have friends in Mt. Pleasant we will stay here again, but at least we know what we are getting. This hotel is old. There is no elevator so you have to carry your luggage up 2 flights of stairs. The floors in the room are so unlevel you are constantly having to walk carefully. They go up hill and downhill every few steps. Walls are thin (crying baby until 10:30 next to us) . Towels are small and threadbare. It was raining and the tile on the sidewalks was wet and VERY slippery! Would not recommend this place. I will not stay here again. 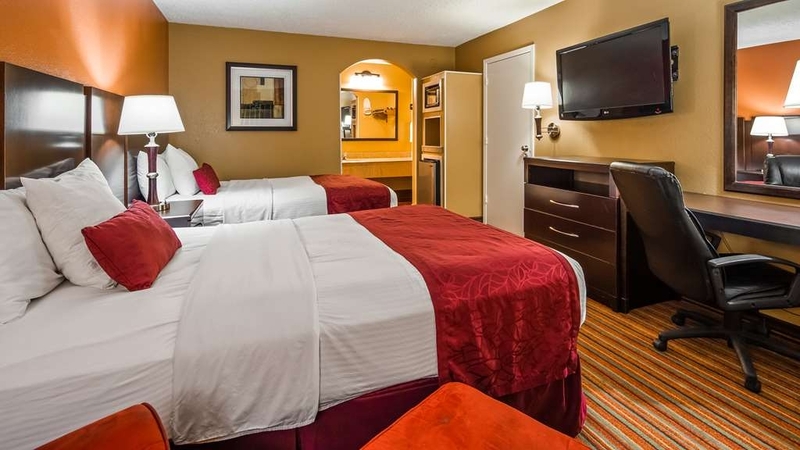 Awesome value with great beds, strong shower, free breakfast with eggs, biscuits & gravy, fruit, waffles and good coffee. We stayed in a King suite with fridge, microwave, couch all very comfortable and clean. My room was clean and comfortable, and was at a good rate. The shower had great pressure as well. I stayed for one night before traveling to Talco, and will definitely come back if I'm in the area again. Great location just off I 30. Clean with comfortable beds and nice breakfast. Only two issues were not getting our wake up calls and someone making noise at 4:30 am. Otherwise we had a comfortable stay as usual. The room was dirty not clean. Television were too small. Good location to order food or get good. Sports channel's were off or blacked out. For a king bed room wss small. Overall my visit was okay. My company has a account with Best Western so I will be staying couple morr times before Christmas. check in process was terrible waited at front desk for 20 minutes before anyone showed up, it was a place to sleep but not a comfortable bed and the microwave and fridge looked and performed like they were from the 1950s. Pathetic!!! Very nice room seemed more like a suite than a room clean and comfortable. The staff was very friendly and helpful! Wonderful we were on the bottom floor yet no rooms were above us so very quiet peaceful room loved my stay here awesome place! Excellent service, very clean and attractive room. I highly recommend the Mt Pleasant Best Western. The staff was very helpful with local information, including restaurants and sites to visit locally. Plan to stay again. Breakfast was ok, not great, but had a variety of choices. Just what you need after a hard day's work and a long drive to boot. 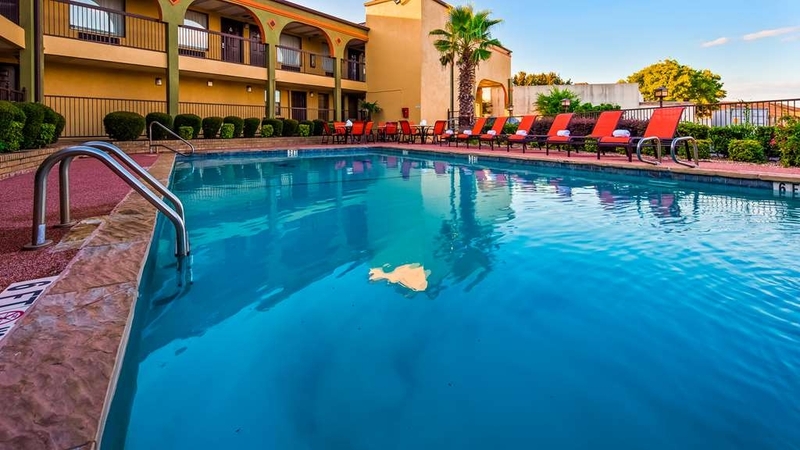 Nice pool, clean property, friendly staff and even has an Italian restaurant close by that delivers right to your door! With everything you need to do in town just a few minutes away, it makes it a perfect location for business or pleasure. Overall my wife and I found this to be an excellent motel. We easily connected 2 computers and 2 phones to the internet. This is a pet friendly hotel, which is important since we never leave our little bulldog behind on our leisure trips. I found the reception area very clean and professional looking with adequate refinements. My only complaint was the elevated office which necessitated stairs. The room was nice and large as well as clean and comfortable. My wife agreed that we should use this hotel again when in this area. Although this is an older properly it is extremely well cared for. Our king room was spotless and comfortable. Attentive staff. Didn't take advantage of the breakfast. Wifi was good. My second stay, will stay again. We were able to park by the door of our room which was nice. Thought the rates were very reasonable. The hotel staff on check in could have been a little friendlier. There were a lot of bugs marching into the room from outside. Maybe if the door fit tight it would have been better. To be fair, most came in while going in and out of room. One big problem was, no signs showing hotel. No markings to indicate this was a hotel. Had no reservations and were road weary, ready for a clean, restful nights' stay. This reasonably priced motel provided it all. Clean, comfortable bedding, great WiFi, wonderful free breakfast left us completely satisfied. So reasonably priced too! This one is a keeper. Everything was satisfactory, with a nice bed and linens. Water emanated from the floor in the bathroom at times, through the tiling. That was less than appealing, but after recurring a few times, it stopped. The pool is a nice sized rectangular one, in pleasant surroundings, except for one side which is hopefully in the process of having new landscaping placed. Exterior could use some upgrading, and the rooms are accessed directly through exterior doors. Bathroom was not as clean as I would prefer, but nothing terrible either. "On the way to visit family"
Our stay was very good. Staff extremely helpful. Only drawback was I am in a wheelchair and the hotel had no handicapped rooms, however the room and bathroom were large enough that I was able to have my needs met. Entrance looked as if nobody was around and the exterior of the hotel could use some sprucing up but everything else was excellent. Jeff at the front desk was especially knowledgeable and helpful. The room was spacious and well-appointed. We did not use the pool area, but it was very attractive. I would stay here again. "Wasn't what I expected :("
Well Best Western does it again to me. Not the quality of hotel I expected. Our room obviously had a roof leak as we had a wet spot on our floor near the foot of our queen beds. The Sofa sleeper was actually a oversized chair that only slept one person however the mattress was coming away from the frame and there was that terrible bar in the middle. So the person who used it had a miserable nights sleep. I was honestly just glad to get there to rest up from a long day's ride and get out of there as soon as I could. I'm not sure how everyone else's room was in my group but I wasn't too excited about mine. Also the pool was closed and it had nasty dirty water in it. Not a pleasant sight to see coming out of your room. To be honest with you when I pulled in the parking lot I thought the place was closed down and that the Best Western was further down. I was just turning around in the parking lot. It turned out I was there. But the staff was friendly. Very friendly. 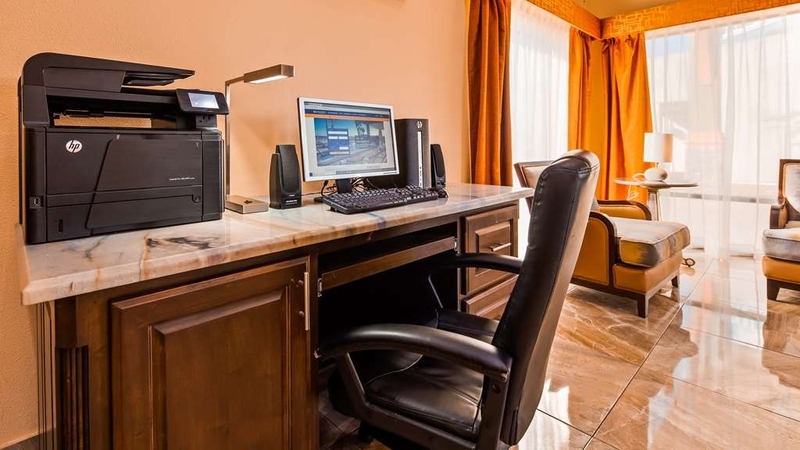 "Quaint Hotel in good location"
Older hotel in a good location, easy access to I30. Several gas stations and restaurants in the area. Location is a bit hilly and walk area are slopped, so need to be careful while walking, especially if it had been raining. We stayed in a mini suite and couldn't be more satisfied. Nice decor, clean, everything works, free wifi, friendly staff, comfortable bed, couldn't ask for anything more. It doesn't look great on the outside, it doesn't look bad, just average. Definitely doesn't look like an upscale hotel but you will be pleasantly surprised by the rooms and staff. "very nice hotel. it's just right." very nice hotel. nice breakfast. nice location. nice people. lovely location. Best Western Hotels are really consistent. you always know what you are going to get. they are never dirty or nasty. I would definitely return. "Great service at an Affordable Price"
Excellent service: check-in and check-out simple and easy; food was great and had full breakfast from delicious waffles to eggs, sausage and bisquits with cream gravy, fruit, cereal, muffins, coffee, milk and fruit juices; rooms with living area TV and bedroom TV, clean beds and bathroom, mini fridge and microwave in the rooms, sofa chair writing desk and coffee table in each room. 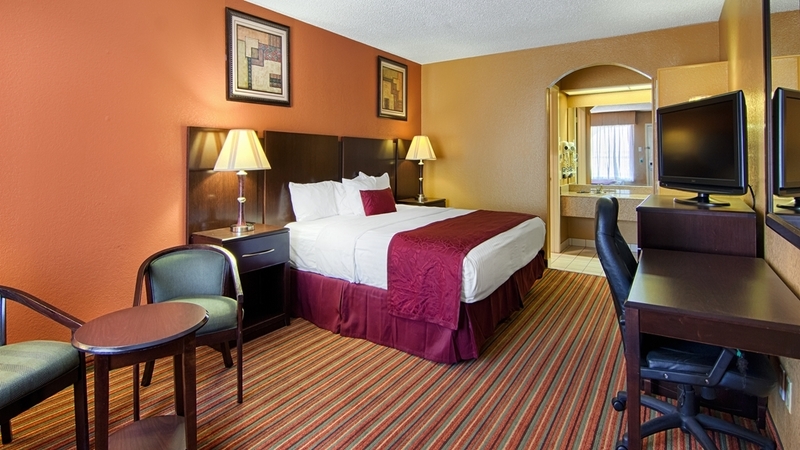 The Best Western in Mt Pleasant is a pleasant surprise. The outside is a work in progress. It is obvious that they are rehabing the place. Our room was quite nice...a suite of sorts. There was a partial divider between the sitting area and the bedroom. Everything was up to date and clean. There were adequate electrical outlets, lighting and a great shower. The bed was comfortable. Breakfast was more than adequate. The employees were friendly and helpful. You really get value for the price. We stayed only one night just passing through. The people that ran it were great. We requested a non-smoking room as far away from a smoking room as possible and after doing a search they found one that the closest smoking room was 3 rooms away. I thought that type of service was exceptional. The room was clean and new. They are going through a remodel and we got one of the newer rooms. The pool was under construction, but that was fine because it's November and too cold to swim. I would stay there again. Actually, I would probably seek it out next time I need to stop in Mt. Pleasant. Room had a fridge, microwave, and free WiFi. "Will be better after needed maintenance"
Not the best in the West, but going in the right direction. Staff was friendly and helpful. We arrived later than expected, but had a nice reception at the front desk. He remembered that we called which is always nice. "Great stay and awesome location"
The only reason this hotel didn't get 5 stars from me was the parking. Parking was awkward. The location of the hotel was perfect, not right in the middle of town and right by the highway and several food locations. The room was very clean and did not disappoint. Will visit again if in the area again. "The outside hides the beauty!" Unbelievable difference from the outside to the beautiful spacious and excellent suites inside!!! I could not believe it when I went inside my room, what a excellent hotel and they know where to put the money on the "INSIDE" very clean room with 2 flat screen tv's, separate sitting area suite for 63 dollars a night!! I cannot say how good a night sleep I had here during a severe thunderstorm which I never heard from inside the room in a topper bed that was soooo comfortable I give it a very rare 5 stars for price and quality!!! THANK YOU, you are what a hotel should be for price and quality!! My husband surprised me with a stay at this hotel and we were very pleased! Our room had a jacuzzi in it and plenty of coffee, wash clothes, and towels! Highly recommend! Just check out the pics! When visiting the quaint town of Mt. Pleasant, you need to visit Sweet Shop USA for some amazing trufles and other sweets! The Edison Phonograph museum is pretty neat, too. I was surprised about this motel. This motel didn't look to nice, the rooms were clean and the bed was very comfortable and ended up getting a good night's rest. The staff was very friendly and helpful. They had one room lift when I checked in. Price was reasonable and breakfast wasn't that great but had a hot eggs and sausage. Great job I would stay here again! "Nice Stay Along the Highway"
We spent a peaceful nights stay at this property. Our room was actually a suite with a small sitting room with TV. This worked out well so one person could sleep while the other watched TV. Staff was pleasant and helpful. Perfect one night stay while traveling. 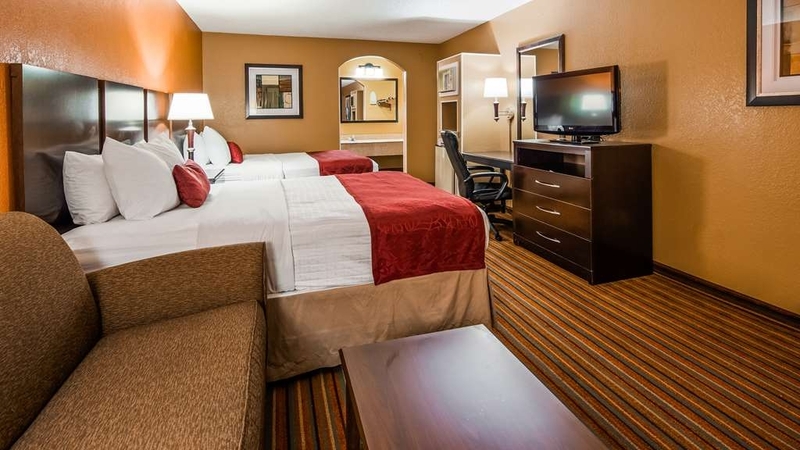 "Helpful Management with Mistaken Reservation"
While traveling in our car, we made a last minute reservation at the Best Western in Mount Pleasant, Texas when we meant to reserve at the Best Western in Mount Pleasant, Iowa. We called the hotline immediately and attempted to cancel. We were told that it was up to the individual hotel so we left a message with the front desk. Once the owner had gotten our message, he was very understanding and refunded our mistake. He was friendly and quick with his communication. I appreciated his understanding. Though I cannot attest to the other facets of this hotel, I can say with certainty that he went out of his way to help us and that was awesome. "Don't judge a book by its cover. " We made reservations online 2 hours before we got there. As soon as we got there and actually saw it I was so disappointed. By the looks of the outside, I just knew it was gonna be nasty and filled with bugs. We got to our room and I was very surprised. It was very clean and no bugs. The beds were made nicely. We would definitely stay there again. I found out right at 4:00 pm that my reservation was at the wrong Mount Pleasant location and was on the phone with this motel at 4:05 pm. They would not cancel my reservation and charged me the full rate for a room. I would understand if I cancelled because I changed my mind but it was a mistake. When I went to the mount pleasant location I thought I had a room at they told me at least 2-3 times a week they have people who had reservations at the wrong mount pleasant. Makes me wonder if it is a computer glitch. After multiple phone calls requesting to talk to a manager at the Texas location I was always told the manager was not there and my calls were NEVER returned. They caused a lot of undue stress on a weekend that should have been all happiness with a child's wedding. I stay here because of price vs. quality. They beat out the competition hands down. I get the military discount and have never been disappointed. The staff is very pleasant to deal with and extremely helpful. Beautifully decorated, immaculate ---- and the front desk / they must have been angels. .... Mr. Smith was on duty that night --and wow--our first night in TX ....made us want to move there! We hated to leave- but had to attend a wedding .... ! The nicest people...easy to pull in -- ( with my walking issues) ... and just wonderful !! I can't say enough about this precious place. The young lady in the morning by the breakfast room was fantastic !!! The nicest best Western on our trip ! Cudos to Jeff Smith and Amy Anderson! VERY HELPFUL!